The term luohan (Sanskrit: arhat) describes the Buddhas original disciples who had attained Nirvâna, and the ideal of the Buddhist quest. This statue of the meditating figure, with its outstanding rosary, conveys a particular state of concentration, a blend of vigilance and determination. The figures balance and monumentality, the visual accuracy of the body and covering kasaya, together with the characteristic expressivity of the Liao-Jin period (10th-13th centuries) in the highly individual portrait, all display the works affinities with the realism of the Tang period (618-907). Comparison with engravings of arhats from the Northern Song (960-1127) have enabled the statue to be identified as that of the sixth disciple, Danmoluobatuo (Sanskrit: Tamrabhadra) sent by the Buddha to Ceylon. The work combines the art of clay sculpture used for religious statuary in earlier periods, and the art of ceramics, involving “three color” glazing, in the Chinese tradition of tomb figures. 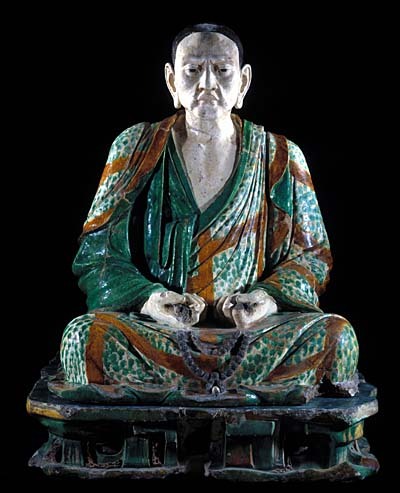 The statue originally belonged to a monumental group of arhats, all executed in the same medium, discovered either in the rock shrine known as the Mountain of the Eight Immortals, near Yizhou, south of Beijing, or in the Yixian rock shrine at Liaoning. All these statues portray holy men who have attained Enlightenment. They all stand on rocaille plinths in an allusion to their chosen place of meditation. Statues from the same period, at Yungang (Shaanxi) and in Gansu, echo this kind of sculpture that faithfully recreated the art of the late Tang, but with a new realism. They confirm that Northern China under the so-called “barbarian” foreign dynasties was the center of a flourishing Buddhist culture that no longer existed in the “legitimist” China of the Song.